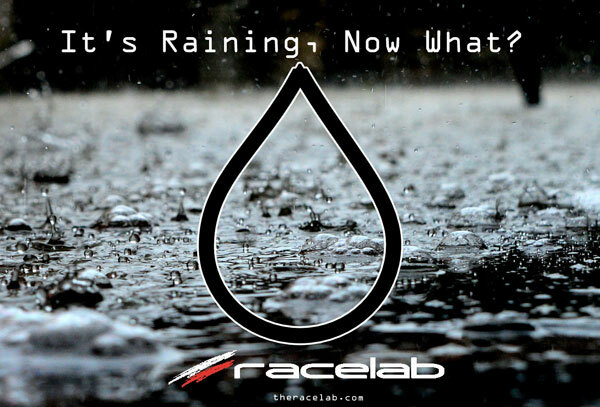 It’s that time of year where you are more likely to see water on the track than rubber, and every time we see the water falling it’s the same chaos led by “Rain driving , What do I do now?” being frantically asked by racers of all levels. Now driving in the wet is an art and while I am more than happy to talk rain racing all day long I figure I’ll touch on the major pointers and give you some ideas of what works. If I give you all the tips then there is a pretty good chance you’ll get lost among them all so lets choose our battles here. In some cases not a lot is required depending on how good your rain tires are and how bad the conditions are. If you are in have rain then chassis adjustments will be necessary however if it is mild and the kart is turning in well then not much might be required. An increase in caster will help with turn in as it helps get that “twist” in the frame and lifts the rear wheel. Increasing the ride height on the front can also give you a little front end bite. to the top side will lower the spindle and raise the frame. The rule of thumb is to get the rear narrow however most rule books won’t let you go any more narrow than that of the the width of the rear bumper. So to clarify your best bet is to have the outside of your rim just about flush with the outside edge of the plastic bumper, I’d suggest going a few millimetres over incase the bumper shifts in action. Increasing your gear helps. We even suggest having a spare clutch drum with a smaller drive gear ready to go in case you are limited for time and the heavens above open up on you as is how it usually goes giving you limited time to make adjustments. Raising your seat up doesn’t hurt in most cases, again this is more of a heavy rain move as it will affect your centre of gravity which is most likely not desirable in light rain driving. USE NEW RAIN TIRES!! you do it with slicks so why not rains? The same set of rains you used last year will not be fast this year, please just accept it. Without good rubber you can tune all day but you won’t achieve anywhere near what you would like to. Keep the driver dry – A rain suit and some sort of waterproof rain footwear is key. Keep your driver warm between heats as well, you don’t want to be racing with a cold so it is important to take care of the most important asset your racing team has. Helmet Care- “helmet care?” how does that work, well actually it does. Part of rain driving is seeing where you are going and any visual limitations are not good for seeing braking zones, other karts and is just flat out dangerous. Molecule produces a great helmet care kit that has a Rain Repellant Spray, and Anti Fog and a Fabric Refresh for those water logged science experiments you have growing inside the helmet. The kit also includes a Cleaner / Polish that will get all of the mud and dirt stuck to your helmet leaving it looking new again. Finally covering the airbox (intake silencer) is a good idea as well, with the ROK and IAME style airbox there are covers that can be found to cover the inlets or in a pinch an old 2 liter plastic Coke bottle will do just make sure there is an air inlet on the back of your new contraption or your motor won’t run. If you have a Rotax then you want to get creative as the inlets are just above the frame rails so putting some plastic our some kind of shroud so water can’t kick up into their from the track would be ideal. So now you have all of those ideas you can work with, I’d suggest spending as much time as possible working on the most important factor and that is the driver. If it’s grey and wet out, there is no excuse for not practicing, you should get out to the track and drive, drive and drive some more in the rain. I even suggest doing it on slick tires as this will teach you what you really need to know about rain driving. It will develop your “kart control” to an elite level in time. This is a proven method to advance and possibly meet those expectations you had even running the used tires. Once these skills are achieved rain driving can become incredibly fun and possibly even more fun than driving in the dry, minus the wet cold socks. This entry was posted in Technical Articles. Bookmark the permalink.